Featuring a revolutionary Quad-pipe architecture and 64MB of memory, RADEON 9000 SERIES provides best-of-class performance to accelerate all popular 3D applications. Four parallel, highly optimized rendering pipelines, typically available only for the high-end gaming cards, significantly enhance performance and game-play responsiveness when compared to the standard 2-pipeline architectures found in most mid-range products. 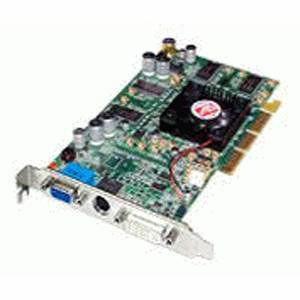 The RADEON 9000 is available in a 64MB configuration, 250MHZ engine clock speed, and an 200 MHZ DDR memory clock speed. Intel® Pentium® 4/III/II/Celeron, AMD® K6/Duron/Athlon®/Athlon XP® or compatible with AGP 2X (3.3v), 4X (1.5V), 8X (0.8v) or Universal AGP 3.0 bus configuration (2X/4X/8X).